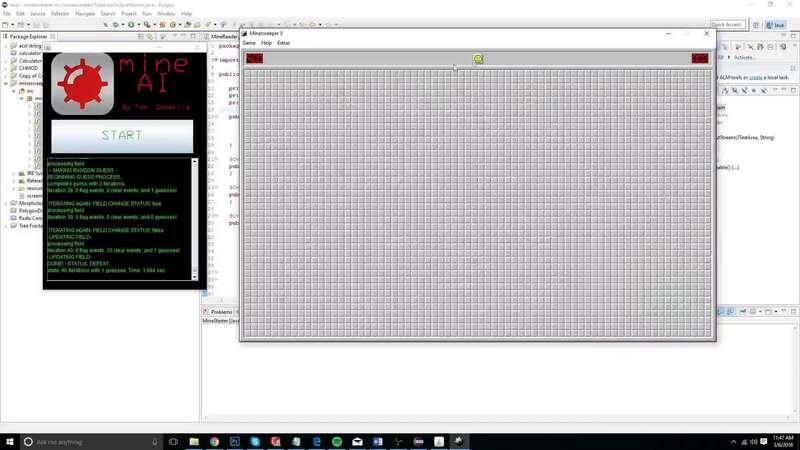 This is a java minesweeper ai, which can play the windows 10 variant of minesweeper: minesweeperX available here. Unfortunately, because the AI relies on using screenshots and having constant window border sizes, it will only work on win10 computers. -start guessing squares until it can “seed” itself and actually have some options. ie start on a blank, not numbered tile. -once no moves can be made, guess moves then keep iterating. -if moves were available, continue to the next iteration. -if there were no available moves, take a cropped screenshot and analyze the tiles to update the field, then repeat.